We accepted a last-minute invite to spend Friday night and Saturday at "Ensign Ranch," a Church-owned recreational property in central Washington. The highlight of the stay was the huge industrial-strength "slip-and-slide." 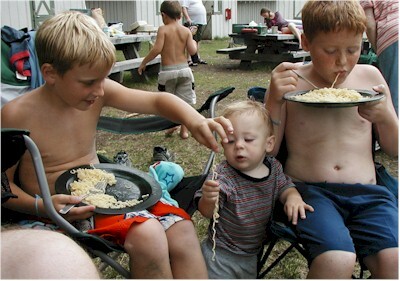 Above, the boys enjoy some ramen off the camp stove. This page is a archive of entries in the Family category from August 2004. Family: May 2004 is the previous archive. Family: December 2004 is the next archive.